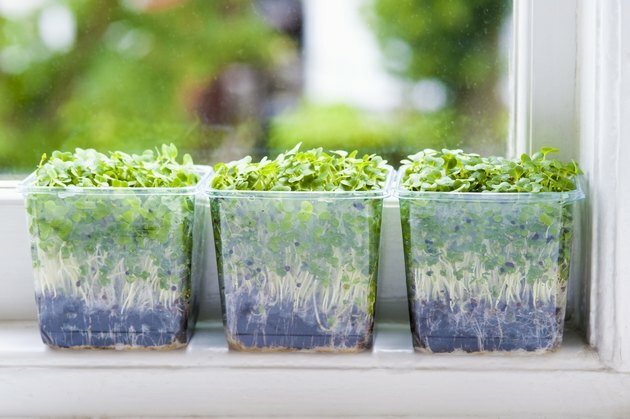 If you have limited space or a short growing season, you may be considering growing food in small containers. "Container gardening" is a fairly common practice, and plastic buckets are the medium of choice. However, with new information about plastic safety, you may be worried about chemicals leaching into your food. While it's always better to grow food in the dirt and away from toxins, certain types of plastic are probably safe for your garden. HDPE stands for high density polyethylene. You can identify HDPE by locating a triangle and the number 2 on the bottom of your container. HDPE is used in milk jugs, juice and water containers as well as most five-gallon food buckets. National Geographic's "Green Guide" claims that HDPE transmits no known chemicals into your food. "Urban Organic Gardener" Mike Lieberman grows a full garden in HDPE plastic buckets. LDPE, or low-density polyethylene, is used most in squeeze bottles and garbage bags. You can identify it by finding a triangle and the number 4 on the bottom of your container. National Geographic lists this another "safer" plastic: it transmits no known chemicals into your food. However, because of its natural flexibility, it may degrade more quickly in your garden, leaving bits of plastic behind. PP stands for polypropylene, a strong plastic mostly used in caps and lids. You can identify polypropylene by a triangle and the number 5 on the bottom of your container, although many lids do not include this "resin number". PP has a high melting point and can be "hot-filled" or used with products that need to incubate. It also does not transmit any known chemicals into food. This makes it an ideal material for a garden container, though large PP containers may be hard to find. PET, or polyethylene terephthalate, is a clear, tough plastic that makes an impermeable barrier. It's mostly used in water, juice and soda bottles, and can be identified with a triangle and the number 1 on the bottom of the container. PET is considered safe for single use, but less safe as a reusable container because it can be hard to clean. This makes it absorb "flavors and bacteria that you can't get rid of," according to National Geographic. Though you may not want to drink from a used PET container, it's probably safe for gardening. PLA is a newer type of plastic, made from renewable sources like corn, potatoes and sugar cane. National Geographic claims that this type of plastic can't be recycled, but will compost in your backyard. This can be ideal for planting seedlings that will eventually break through a plastic barrier and root in your garden.